Chinese companies are now flooding the American market with cheap Chinese solar panels and devastating the American manufacturing sector that was gearing up to create tens of thousands of U.S. jobs for our own ailing economy. Hundreds of U.S. solar manufacturers now see their prospects as grim. BP Solar, Evergreen, and General Electric have already announced the closing of American-based solar panel factories and outsourcing, primarily to China. Read full Huffington Post article..
A team of researchers from the University of Tennessee, Knoxville, and Oak Ridge National Laboratory showed that photosynthesis may function as a clean, sustainable source of hydrogen. The team, led by Barry Bruce, a professor of biochemistry and cellular and molecular biology at UT Knoxville, found that the inner machinery of photosynthesis can be isolated from certain algae and, when coupled with a platinum catalyst, is able to produce a steady supply of hydrogen when exposed to light. Read the full Science Daily article. New Jersey is the number two U.S. state (after California) for solar power generation. In the hope that market efficiencies could help control costs over time, the state has turned not to a tariff-style guarantee, but to a complex approach that relies on a floating, market for tradable solar renewable energy credits (SRECs). An oversimplified version: install a solar system on your roof or install a commercial system on a warehouse or in a field and each year you’ll earn SRECs based on how much power your system generates annually — one credit for each 1,000 kilowatt hours. You can then turn around and sell your credits back to companies that generate power for the state’s grid. The companies can use the SRECs to help them meet state renewable portfolio standards that steadily ramp up to a mandate requiring that 22.5 percent of their energy come from renewables by 2021. The credits are actually sold by brokers on an electronic market, like stocks or bonds, at whatever price the market will bear. At the moment, the market is bearing a fabulous price. It takes a calculator to work through the complexities, but with SRECs currently selling for just under $700, and the federal tax credit as well as a reduced state rebate in play, a homeowner in the state can pay for a solar system in four years or less. Read full article at WorldChanging.com. The Food Preservation committee is dedicated to helping gardeners preserve their bounty. One of the worst things that can happen to a gardener is to have a gorgeous crop only to see it go to waste or rot because it cannot be used before it goes bad. We hope to remedy this situation by giving you all the information we can on food preservation. There are many ways of preserving food. Some of them are; dehydration, canning, pickling and freezing. The main thing is to not be scared of the process. It is not necessary to put up an entire acre of food as was done in years past. It is possible to preserve a few jars or bags at a time. This is especially important these days when we all have to work at jobs away from home. Some publications that might be helpful are the following. Dry It You’ll Like It, by Gen Macmaniman. This is a self published book full of fun and neat ideas. It is available from amazon.com.. The last printing was 2000, and it may be only available as used. But if you are into drying food it is worth the effort to find it. Ball Blue Book, Guide to Preserving, available online but not through the Ball canning jar company’s web site. This book has been around since 1909 and is still the definitive book on food preservation. It covers almost all aspects of food preservation from canning to pickling to freezing. All types of foods are included. Preserve It Naturally, The Complete Guide To Food Dehydration. This book is put out by the Excalibur Dehydrator company and is available at www.excaliburdehydrator.com. This is an excellent guide to dehydrating all foods and is especially helpful by rating how well each food dries. We will be having a table set up at the Sustainability Fair on Nov. 12. Be sure to stop by and see us. A PBS video available online featuring Michael Pollan and based on his best-selling book, this special takes viewers on an eye-opening exploration of the human relationship with the plant world — seen from the plants’ point of view. Narrated by Frances McDormand, the program shows how four familiar species — the apple, the tulip, marijuana and the potato — evolved to satisfy our yearnings for sweetness, beauty, intoxication and control. Start you holiday shopping in green way! We are hosting a special holiday gift fair featuring local businesses that support greener lifestyles on Maui. The fair will include more than a dozen vendors showcasing locally produced body care products, fresh island-grown produce, Hawaiian herb guides, food preservation tips, recycling services, personal chef services and much more. Affordable gift certificates and sustainable products are available for purchase. The event will also feature delectable pupus, crafts and a presentation on eco-friendly tips for the holiday season. For example, you’ll get ideas for great looking sustainable gift wrap like the one pictured. 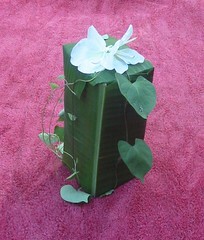 Maury King created this beauty from his garden by using a fresh banana leaf, tying with some vines and adding white ginger flowers. Please join us for a fun and informative evening! For more information, please see our SouthMauiSustainability.org. For the last few weeks, several South Maui Sustainability (SMS) members have been working at Kihei Elementary to prepare the way for an installation of a new school garden. The garden, designed by Susan Wyche of Green Perspectives in collaboration with the Kihei Elementary teachers, will include raised vegetable beds, fruit trees, and trellises for bean and other vegetables. This week, a team of volunteers led by Derrick Salomon installed the underground irrigation. 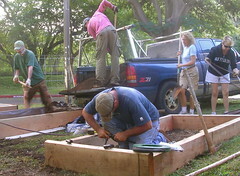 The next step is for community volunteers to join SMS and the Kihei teachers on November 7 and 14th (two Saturdays in a row) to build the beds and trellises, make compost boxes, and spread soil amendments and mulch. Like many school grounds, Kihei Elementary’s landscape consists primarily of asphalt and large swaths of lawn. The new garden changes that, as it sits in the center of the school and will become the focus for outdoor classroom activities. 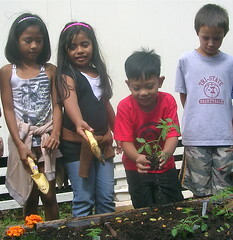 Students will learn about growing food, identifying pests, and making compost. The garden can also be used for art, math, science, and reading activities, as teachers integrate time in the garden with other subject areas. This project took root last year, when second grade teacher Alana Kaopuiki asked Emily Goss, a core member of SMS, if the group could build a small garden of three beds that Alana could use for teaching second graders. The garden was such a hit with the kids and the teacher that this year, when SMS asked if any other teachers would be interested, 15 additional teachers signed up. The new garden is designed to accommodate teachers from all six of the school’s grade levels. 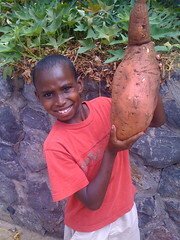 That’s a lot of beans, tomatoes, taro and bananas! Already the garden has become a broad community effort, as donations and discounts from Kihana Nursery, Maui Nui Botanical Garden, Maui Earth Compost, Miyake Concrete, Honsador Lumber, Allen’s Plumbing, and others have made the garden possible. Many of the costs have been underwritten by a grant from the County of Maui, to SMS’s sponsor, Tri-Isle RC&D. If you are interested in getting your hands dirty, please join us. Bring a shovel, rake, or wheelbarrow—if you have them—but at least a hat, sunscreen, pair of gloves and a plastic cup or water bottle (cold water will be provided on site). Sign-in will be at 8 AM, followed by a short groundbreaking dedication. Come join your neighbors and friends as we complete the installation for South Maui’s keiki. The address is 250 E Lipoa St (entrance across from Kihei Community Center). Look for our blue and yellow South Maui Sustainability signs. How long does a fish live? 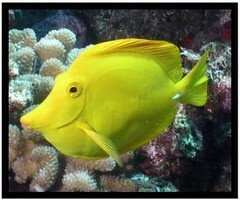 Would you be surprised to know that some species of tropical fish, such as the Yellow Tang here on our South Maui Coast can live 40 years or more? According to forthefishes.org, 99%+ of the over 2,000,000 (estimated number since no government official checks on reported numbers) fish collected annually from Hawaiian waters to ship to aquarists die in less than a year. How does this affect South Maui’s reefs? Most of the collected fish are herbivores. Because they eat algae, herbivores are necessary to maintain a healthy coral reef. Without these beautiful grazers the reef will ultimately be smothered and die. With the additional land-based pollution pressures of injection well waste-water disposal, sedimentation by construction development, and built-environment run-off, as well as the introduction of invasive species of algae and warming ocean temperatures, our reefs can ill-afford the loss of their natural protectors, the tropical fish. What can you do to help? Join Project Sea-Link at projectsealink.org and learn to conduct fish surveys while you are enjoying your morning snorkel swim or scuba dive. Contact the Mayor’s office, County Council members and our legislators and let them know how you feel. To learn more, please read Rene Umberger’s presentation on fish collection in Hawaii. October’s SMS event, From Basics to Bounty, addressed tips for gardening successfully in South Maui. Landscape designer Susan Wyche opened the meeting with some basic instruction, covering aspects of local micro-climates, soils, and edibles that grow well here. Her introduction was followed by a lively interactive audience Q & A session, in which over 80 participants raised issues or offered solutions. Everyone had something to share. Susan’s introduction focused on the important role that soil health plays in developing healthy plants. She highlighted that our South Maui soil has a nice supply of micro-nutrients, but that gardeners must learn the secret of cultivating the micro-organisms that unlock the nutrients for plants to use. These organisms are so small that you can’t see or hear them, but you can smell the “rich earth” fragrance of living soil. It’s like the “Whos down in Whoville”, a small but active world of fungi, algae, protozoa, nematodes, and other creatures whose names would delight Dr. Suess. Gardeners need to ask, Are there Whos in my Whoville? If the answer is no, then begin building the organic matter and altering the moisture content so that these important creatures can thrive. It takes time to build up living soil so Susan suggested that gardeners can start gardens quickly using raised beds and containers. She divided edibles that grow well in South Maui into those that are easy and require little work—such as bananas, papayas, sweet potatoes, figs, citrus and herbs—and those that take more care, but can still thrive—such as tomatoes, peppers, eggplant, squash, and Asian or tropical greens. The discussion focused on how to respond to common pests and diseases, including white flies, aphids, Chinese Rose Beetles, sooty mold, and blights. Audience members talked about how they use water sprays with biodegradable soaps to attack white fly, aphids, and sooty mold. Others spoke of the impact that building soil will have in helping plants to fight off pests on their own. One audience member suggested dealing with mealybugs by applying a spray of ground up mealy bugs. Susan encouraged the audience to use non-toxic, pet-friendly snail bait when fighting snails and slugs, and reminded them that two environmentally friendly solutions include keeping ducks and chickens in the garden or setting out tins of stale beer overnight. To encourage the discussion to continue beyond just the night’s event, South Maui Sustainability has set up an NING site for exchanging questions and tips. Who Is Our Sustainable Community? South Maui Sustainability is 1½ years old. There are over 700 people on our mailing list. But we don’t really know who most of you are or how interested you might be in getting involved with our group beyond getting our e-mail. Attendance at our monthly meetings has been from 50 – 120 people. Our best attendance seems to come from meetings about growing food, but we don’t really know what people in South Maui are really interested in. We don’t know what our ‘members’ have to offer to help us further our goals and to find out what yours might be. As you will see from other articles in this newsletter and a visit to our website, there are many things SMS is involved with. We continue to discover new things about sustainability every day. We need community members that share our values to come and play with us. At least one other group, Upcountry Sustainability, has sprung up and we’re encouraging sustainability groups to start all over the island. The time has come. We are here to offer our support to anyone that wants to start a new group. Let’s work together so we can create a more sustainable Maui. We hope to see you at our November 12th Sustainable Gift Fair, where you can get your holiday shopping done and share your sustainability interests. 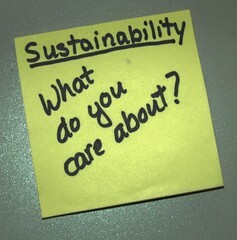 Or you can share your thoughts on sustainability with us by sending us an email.